* The second book in The Ken Blanchard Series-selected and with a foreword by Ken Blanchard * A unique and practical "action approach" to servant leadership-a popular and widely espoused concept that figures prominently in the writings of Ken Blanchard, Peter Senge, Stephen Covey, Peter Block, and many others * Uses a compelling story format with highly sympathetic characters to make servant leadership accessible to a wide audience At a time of increasing concern about ethics at the top, The Serving Leader makes the case for an approach to leadership that is both more moral and more effective than the ruthless, anything-for-the-bottom-line approach that has brought disgrace-and often ruin-to many once-mighty organizations. "Serving leaders" lead by serving others, not by using them. As one of the characters in the book notes, "A leader qualifies to be first by putting other people first." It sounds paradoxical, but it works-and The Serving Leader shows precisely how and why. While The Serving Leader uses a parable to outline the basics of servant leadership, all the people in it are based on real people, the organizations depicted are based on real organizations-and the results they achieved are what really happened. 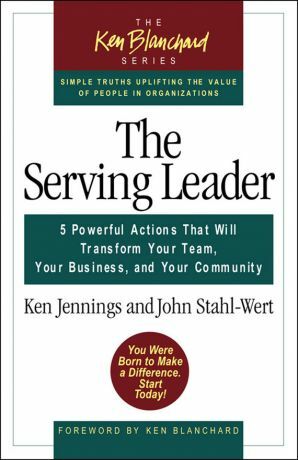 Ken Jennings and John Stahl-Wert use an engaging and moving story about an estranged son, his dying father, and a remarkable group of innovative leaders in business, volunteer organizations, and civic groups to illustrate five pragmatic principles of servant leadership. On one level The Serving Leader is the most practical guide available to implementing servant leadership; on a deeper level, it is a book about the personal journey of growth that real leadership requires.